Seiko made the first ever quartz watch in 1969. Quartz movements are very accurate, reliable and require minimal maintenance aside from battery replacement, usually around every three years. This is inexpensive and easily changed with modern watches. 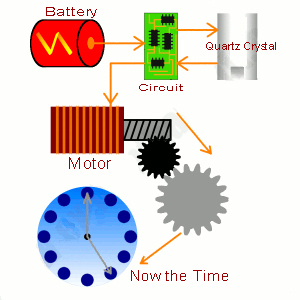 A quartz movement utilizes the battery as its primary power source to create power. The battery sends an electrical current through a small quartz crystal, electrifying the crystal to create vibrations back & forth at exactly 32768 each second. These vibrations keep the movement oscillating and drive the motor to move the watch hands.